Thanksgiving is right around the corner and that means the china and crystal will make its appearance on the dinner table … unless you prefer Chinette so you don’t have to wash dishes! In my family, we like to turn special occasion dinners into an experience, and part of that experience means setting a pretty table. The first thing I do when setting a festive table is determine a vignette for the centerpiece. 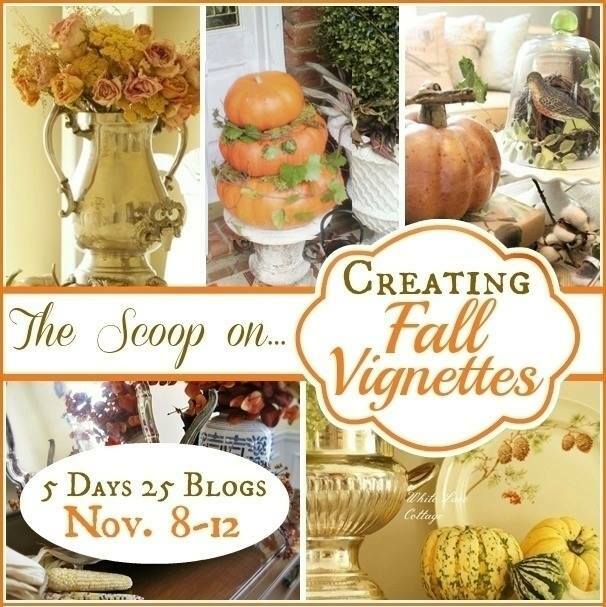 And since I’m celebrating Fall Vignette How To’s this week with some of my blogging buddies, I’m going to show you how to make a fall centerpiece. Centerpieces can be left on your table as a vignette before and after the holiday. Typically I start with one item as the inspiration for my centerpiece or vignette. 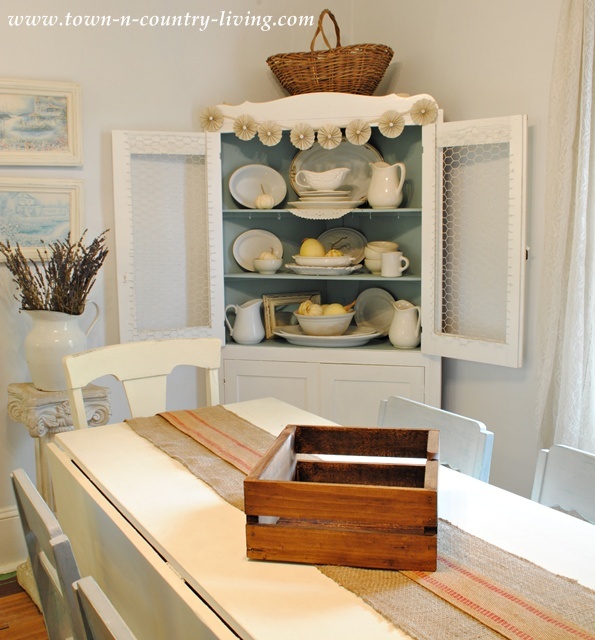 The wooden box was my inspiration – and it was a trash pile find! I’ve got the box along with burlap and jute webbing, candles, paper, twine, leaves and berries. This is the table that’s getting the new fall centerpiece for a vignette. 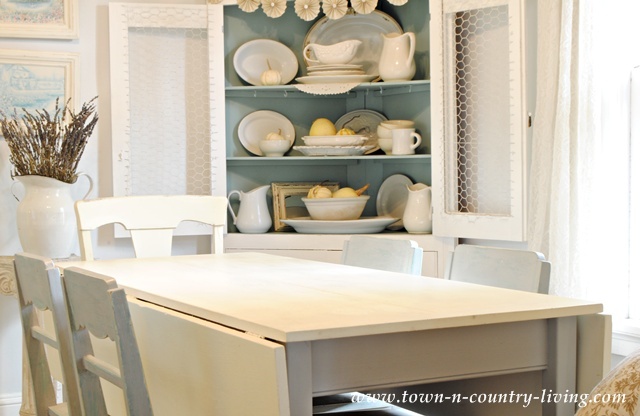 White is pretty, but it could use some warming up for fall. Add the first layer to the table. 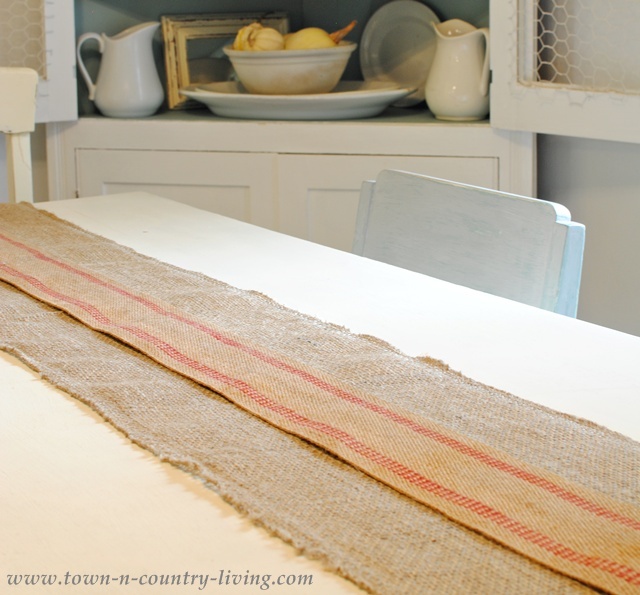 In this case, I used two pieces of burlap webbing side by side to create a runner. Next step is to lay down a piece of jute webbing to cover the “seam” from the two pieces of burlap webbing. 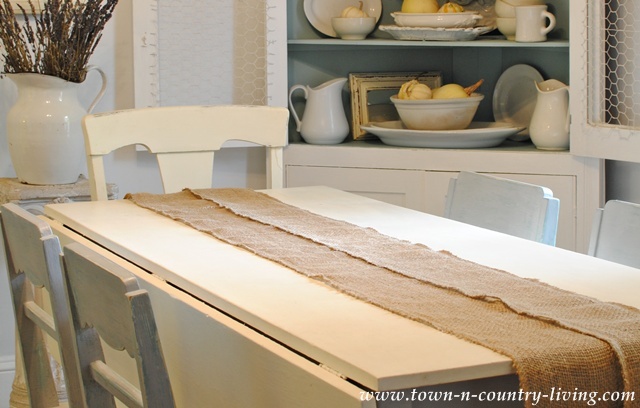 I decided to place the stained box at an angle so it breaks up the lines of the table runner. I treated the box with dark wax, which is much easier than using traditional stain. No drips and no mess! Next, we’re going to decorate the white pillar candles with scrapbook paper to add a little color. 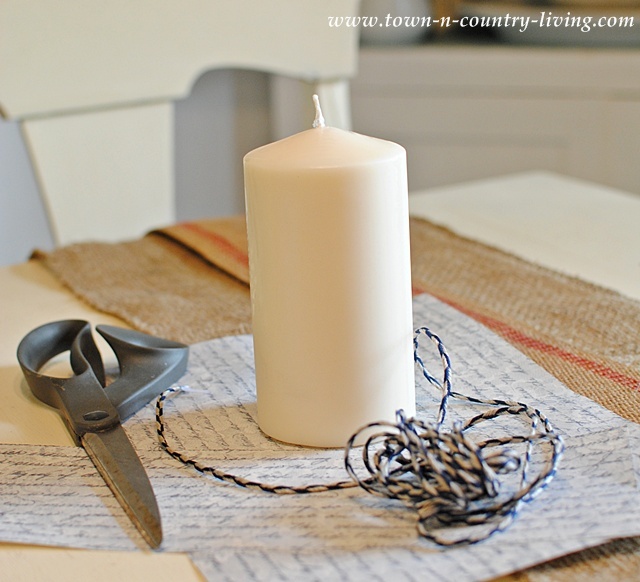 Cut your scrapbook paper to size, wrap around the candle, and tie in place with twine. Since the candles were a little short, I used books inside the box to make them taller. You can also use ramekins to add height to individual candles, like the one in the front on the right. I used an odd number of candles (odd is more pleasing) and staggered their heights. 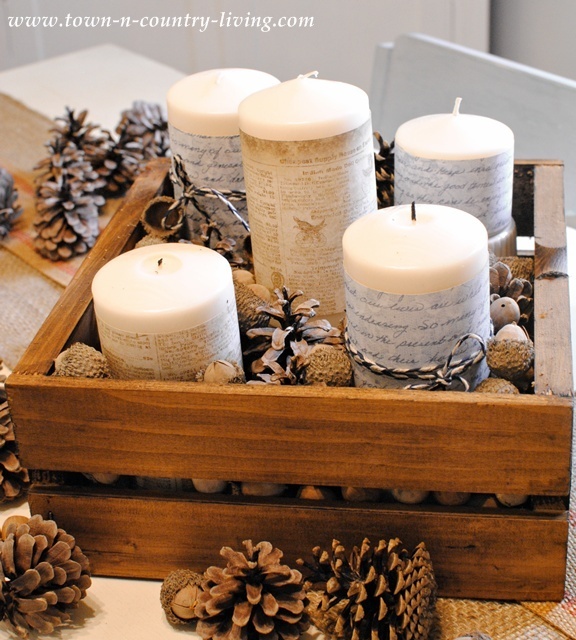 To hide the books and add interest and texture, fill the box with acorns and pine cones. These were free as I collected them from outside. Now for some fall color! 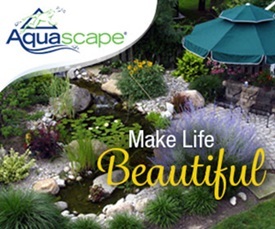 Add some twining leaves that are flexible. You can get them at your local hobby or craft store. 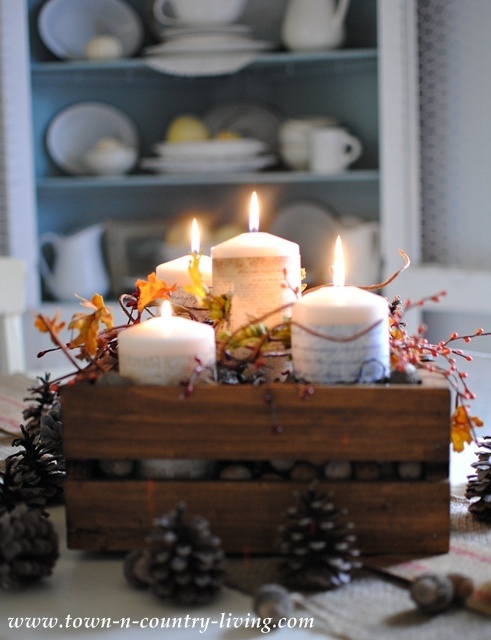 Bend the branches and leaves around the candles, with some extending beyond the box. Finally, add some colorful faux berries to your fall vignette. Scatter a few acorns and pine cones outside the box, to make it look like they spilled over. This helps to transition and blend the centerpiece into the rest of the tabletop. And that’s my instructions on how to make a fall centerpiece. It wasn’t that hard, was it? It didn’t cost a lot either. The leaf vines and berries were on sale … and of course the box was free! The candles and scrapbook paper were items I already had on hand. 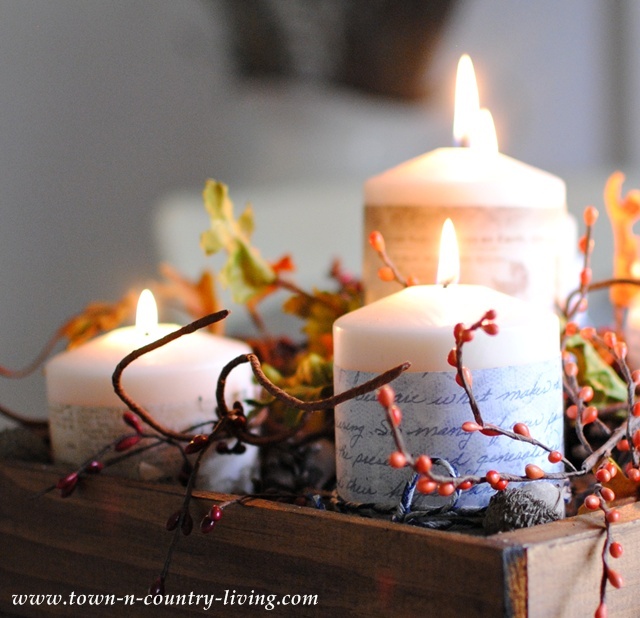 One thing I love about fall is lighting candles around the house to create cozy warmth. I hope I’ve inspired you to create your own fall centerpiece. 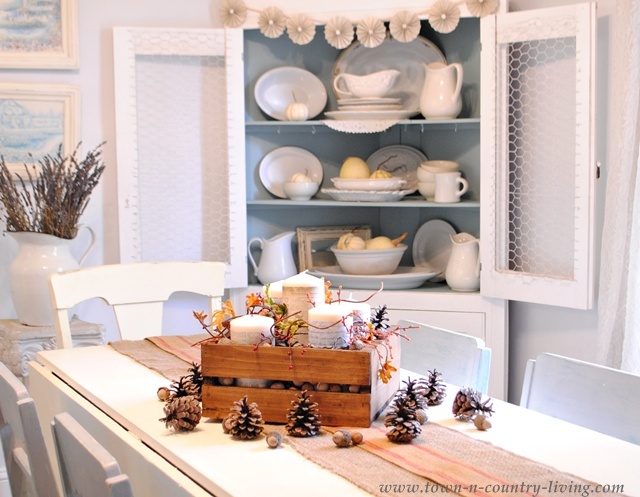 Be sure to check out all the fall vignette how-to’s this week. You won’t be disappointed! Beautiful! I love how you can pull things together so easily and keep it budget friendly. Beautiful centerpiece, great how to! your images and centerpiece is so beautiful. I love the idea of wrapping paper around the candles. Have a great fall day! I love this rustic centerpiece, Jennifer. 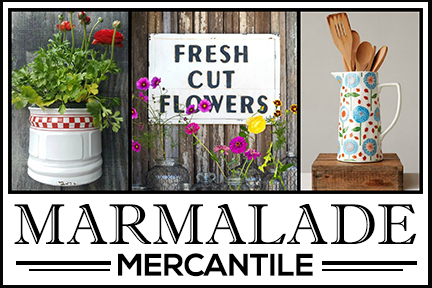 Simple items come together to create something so pretty. 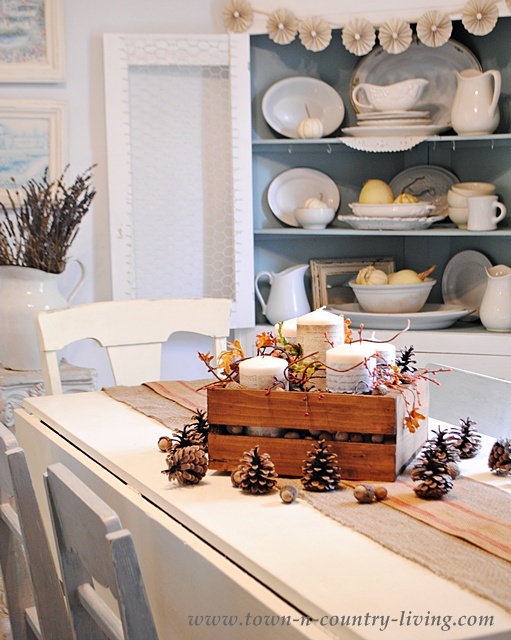 Your centerpiece really does add a cozy warmth vibe to the whole dining room! 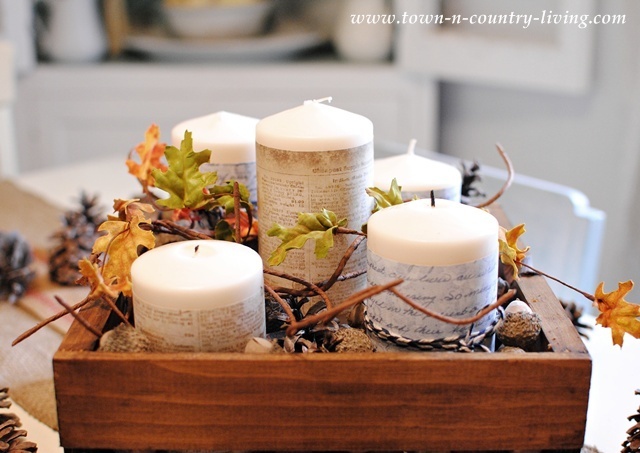 Love all the textures you used to make a lovely centerpiece that sets the tone for the holiday. Your vignette is gorgeous Jennifer! Love the simplicity and elegance! I loved your idea of using scrapbook paper around the candles. I love all the decorative papers, but hadn’t thought to wrap them like you did! thanks! I use the beautiful papers for picture matts, and inside old trays but love your idea! you could probably even decoupage it onto the box if that was the look you were going for. Oh you’ve got my mind running now! What a treasure find with that crate! 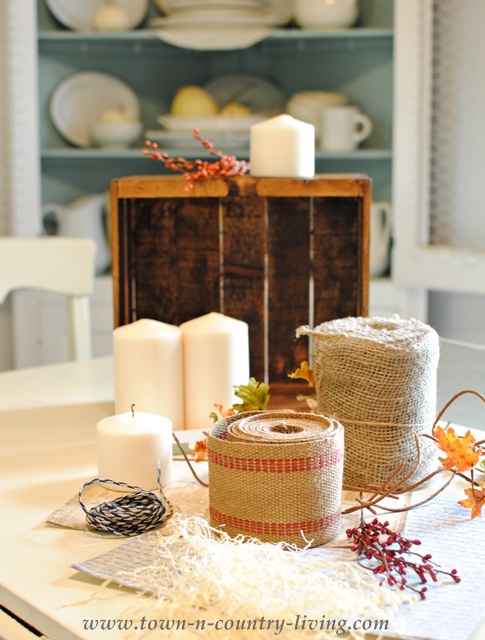 I love the burlap and all the layers of fall goodness… just beautiful! Jennifer so sweet and pretty. I love all the natural with the candles. I too love candles. Very pretty. Excellent !!! Love the vignette and the tutorial. Makes me want to go make one. 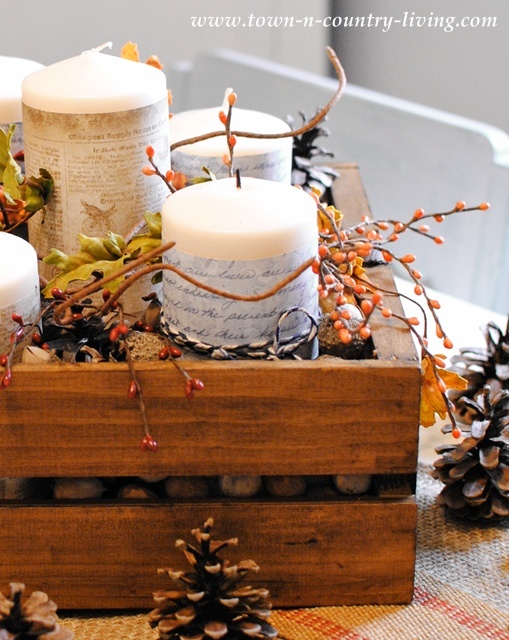 I love your fall centerpiece with the crate. 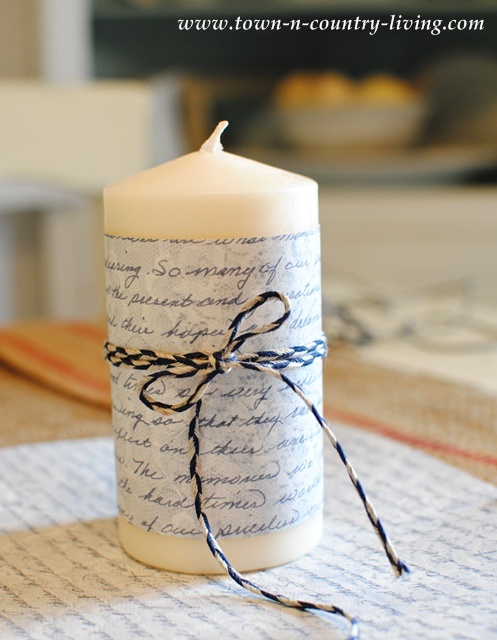 Your candles wrapped with paper and other decor make such a pretty vignette! Loved your candle vignette…had to Pin it. I had some of the same ideas about candles, but went in a little different direction. What great tips for creating height and hiding it with acorns and pinecones. Gorgeous vignette! I’m a newbie at decorating even though I am a Grammie. Have been trying to find burlap type ribbon with little success. Michael’s just had 6-8 inch wide burlap. i wanted to use a holiday dishtowel to wrap a bottle of wine and then tie it with burlap ribbon. Where did you buy yours? Thanks for any help or advise you can give! How beautiful, Jennifer! Simple but it certainly does make a huge statement! This could be tweaked for almost any time of year! Wonderful tutorial! I really love this centerpiece! It’s the perfect height – not too tall! 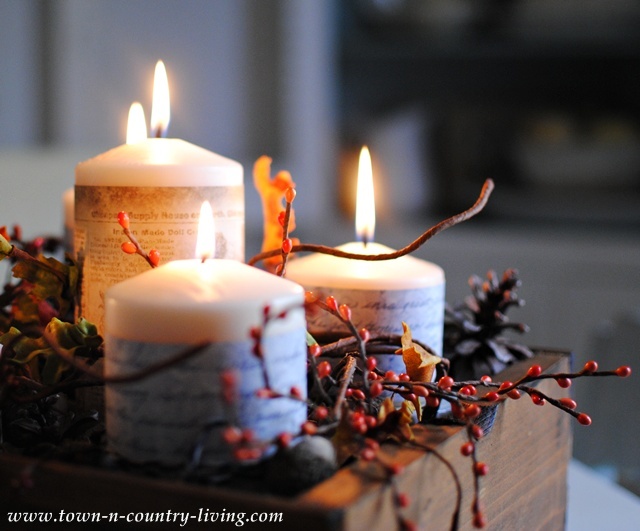 My favorite are the wrapped candles – I want to do this for Christmas! Thanks for sharing! Beautiful centerpiece! Thanks for sharing about using some dark wax for the box…looks great. I like making some DIY runners too…they are so fun and thrifty. This looks so very lovely. Although I can ‘design’ a room, I sometimes struggle with the little things (which are what adds the most punch!) 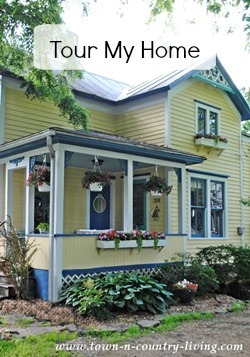 I love that you completed this step by step to show various layers that add interest. Sharing on my Facebook! 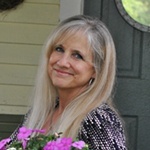 Beautiful Jennifer….as always! Thanks for the tip on the wax instead of messy staining. Nothing says fall to me more than candles. I love your centerpiece! Your fall centerpiece is beautiful! I loved seeing all the steps you took. I so enjoyed it. 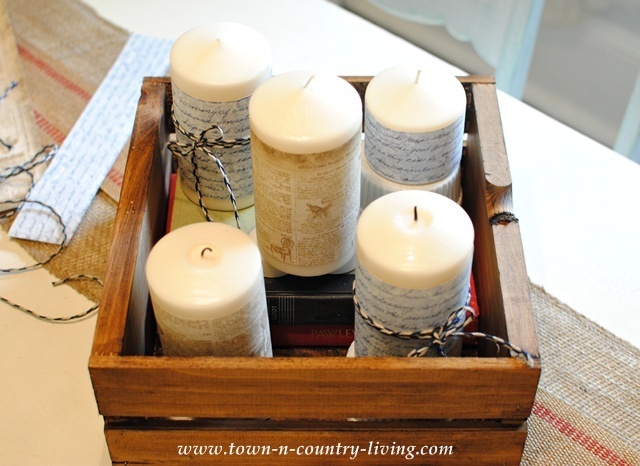 I love your tip about using the dark wax on the wooden box and how you used the two pieces of burlap webbing as the base. Your centerpiece is beautiful and I love the photos of the candles burning! Jennifer, this is PERFECT. I too like to use items on hand and not spend too much on seasonal things that then have to be stored. Bravo on the free crate, which you can use over and over again all year long filled with different goodies! Thanks so much for joining us on the tour!! Oh it is SOOO beautiful Jennifer!! And the step by step instructions were awesome! So glad to be part of this tour with you! Have to tell you I absolutely love your centerpiece, how it relates to your room, how it looks like it would feel in the room. So casual but very warm, welcoming. I love to use things I already have, make them look like they belong where they are. You did a wonderful job of staging. I also appreciated the runner on the table, what a great idea and angling the box. Lucky you having hubs bring those boxes home, you’ll get lots of miles out of those.